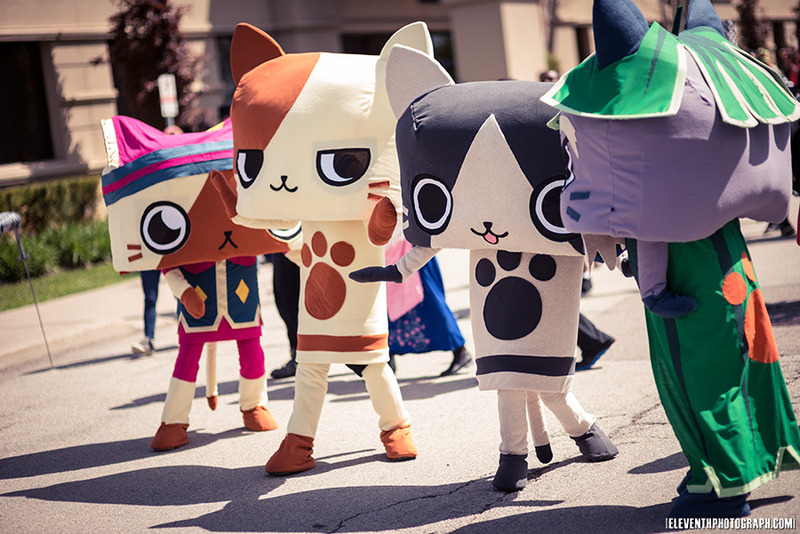 A strong eleven, years at Anime North. It was ten years ago, back in 2004 when I attended my first convention ever, Anime North. Oh how much has changed since then, the world is almost unrecognizable now! One thing stayed the same, there are still Naruto cosplayers. Con Photos Quick Link - Masq Photos now Up! My weekend did not begin with AN, but with Henry’s Photo Expo about 10 minutes away. I toured the con for a few hours and bought nothing before heading over to AN around 4pm. I had three shoots on Friday, including a sunset shoot with an Amazing Zekrom, so I’m pumped to start editing my photoshoots! The weather for the weekend had some chance for showers, but luckily I don’t believe there were any! Another beautiful warm year, which notably included me getting a bit sun burnt. I did not expect the sun to be so hot and did not put on sunscreen, until Sunday. I should really be thinking more about sunscreen for summer month conventions. I found the layout of the TCC (dealer’s room, artist alley, & Misc.) to be pretty good. It was setup so you’d get a flow going through most of the areas. The Dealer’s room has especially grown, I remember it being in the back taking up maybe a quarter of the room it does now. 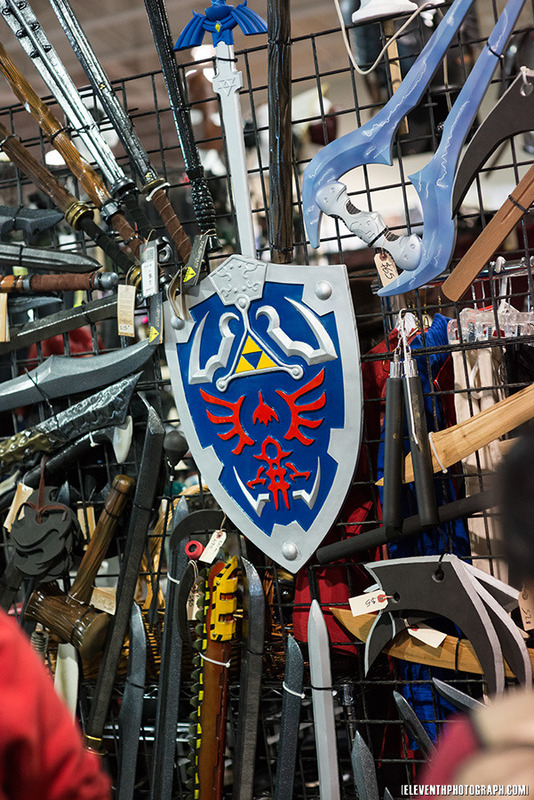 The variety of merchandise that’s in the dealer’s room also seems to have gone up, it used to be mainly just Manga and DVDs, but now it’s almost equally distributed by weapons, food items, toy figurines, video game stuff, photography booths, corporation booths, jewelry, etc… Nice to see that it’s so diverse. I think my only complaints would be to the TCC itself; complaining about the garbage overloads (been happening for years, they know AN is and to get more staff changing the bags more often), the fenced off area at the front/corner of the building (not really their fault, but just unfortunate that it would have helped with traffic more). The parking lot asphalt at the north end is just horrible and disintegrating at this point, it really needs to patched up SOON. You can’t just pylon-off each spot. Another even worse matter is the holes in the ground on TCC property. On the sidewalk near Harvey’s, right on the edge of the cement there was a huge hole in the ground about 2 feet deep and about a meter long. I witnessed a few people falling/tripping in there. I think by late Saturday they had a few pylons thrown in there, but sheesh. Once again, if your venue is expecting 25,000+ people, make sure your property is up to par. I do hope AN staff consider using the North TCC building next year. It looks like a great way to increase attendance limit and to have more real estate on which to run more events, more dealer room space, etc… The construction that was happening there last year successfully connects the two building through an underground passage! So people don’t even have to go outside in order to travel between the two buildings. *Fingers crossed for North building use next year* And even a more far ‘fetched idea is to have a skywalk connecting the Doubletree and TCC together, likely not going to happen but would be neat if it did. I did see a lot of creative and great cosplays throughout the weekend, and I don’t think I’m alone when I say the quality of craftsmanship has gone UP for a lot of beginner cosplayers. They’re really raising the bar and that’s great work guys! I attended the masquerade Saturday night and am a bit surprised by how much it has changed over the years. There used to be many musicals and stretched-out skits, but now its mainly walk-ons. That's good cause it means more people can enter the Masq, but on the other hand I don't mind a good share of all types. I do appreciate well thought-out funny skits so props to those people! Oo-de-lally, Oo-de-lally, Golly, what a day! I’m still working on Masquerade photos, but have the General Photos already posted. Give them a look and don’t forget there are two pages! If you wish to purchase an HQ version, it's $5 per photo. Free HQ versions for any Masq photos. And if you haven't, my May Photoshoot giveaway is still running for another few days!